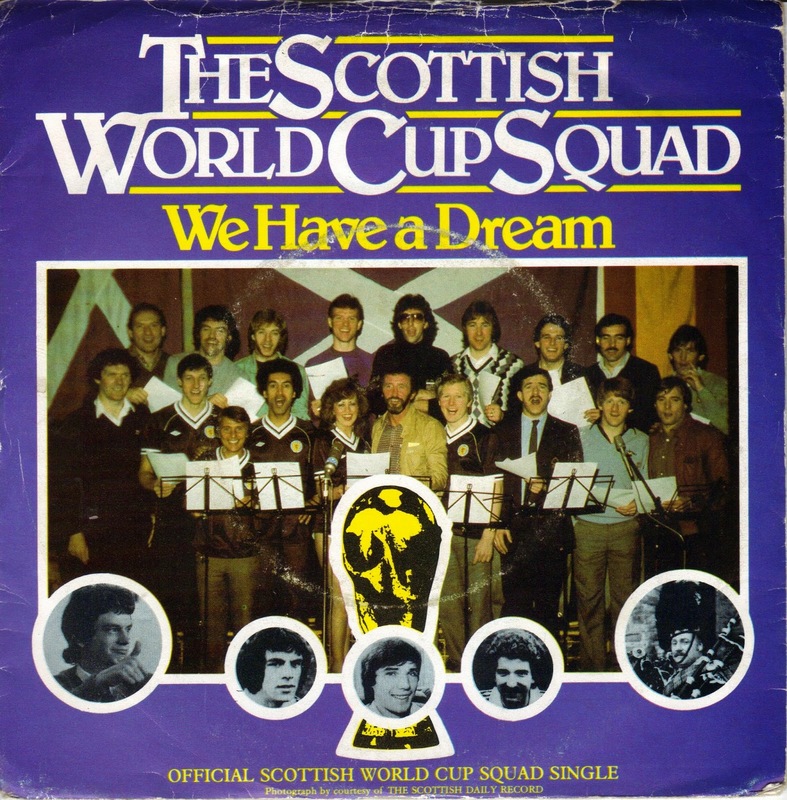 As England have recently been forced to accept ignominious defeat in the 2014 FIFA World Cup, this seems to me to be the perfect time to head north of the border, to Scotland, and the Scottish World Cup Squad’s awful 1982 single We Have A Dream. If you think England has performed appallingly, perhaps you should consider the fate of the UK’s other national teams: since WW2 Scotland have never advanced beyond the first round of the finals competition, missing out on progressing to the second round three times on goal difference (according to Wikipedia. Me: I couldn’t give a rat’s arse about the dull game). Wales only appeared in the 1958 World Cup because other countries refused to take part. Northern Ireland have appeared in the finals of the FIFA World Cup on three occasions: 1958, 1982 and 1986. So, back to Scotland. This dreadful piece of flag-waving Braveheartism comes from the pen of B A Robertson, the Scots singer and composer who had scored several solo hits between 1979 and 1981 with Bang Bang, Knocked it Off and Kool in the Kaftan among them, plus a duet with Maggie Bell and Hold Me. This hideous hymn to nationalism, which actually reached the Top Five, features actor John Gordon Sinclair telling the story of a dream he had about Scottish football success. He later resuscitated this Scottish footballing connection by narrating the 2006 BBC Scotland documentary series That Was the Team That Was. Sinclair is probably best known for his appearance in the films Gregory’s Girl and Local Hero. The single was re-released in 2008 to raise money for the BBC’s annual Children In Need telethon. That version featured a host of celebrities including Samuel L. Jackson, Ashley Jensen, Dougray Scott, Chris Hoy, Ally McCoist, comedian Fred MacAulay and actress Elaine C. Smith along with Sinclair reprising his role. The B-side of the original 1982 version, Wrap Up the Cup I B A Robertson's 'rap' track - is equally heinous, and is also included here. Outside of his solo career, Robertson also co-wrote Carrie and Wired for Sound for Cliff Richard and penned and sang the theme music to the television series the Multi-Coloured Swap Shop (Hello, Hello, although, to be perfectly honest, I can’t recall this song being used: the Swap Shop theme I hear in my head is completely different (Swap Shooooop! Do-do, do-do-do-do-do-do, do, do-do-do-do-do-do…). 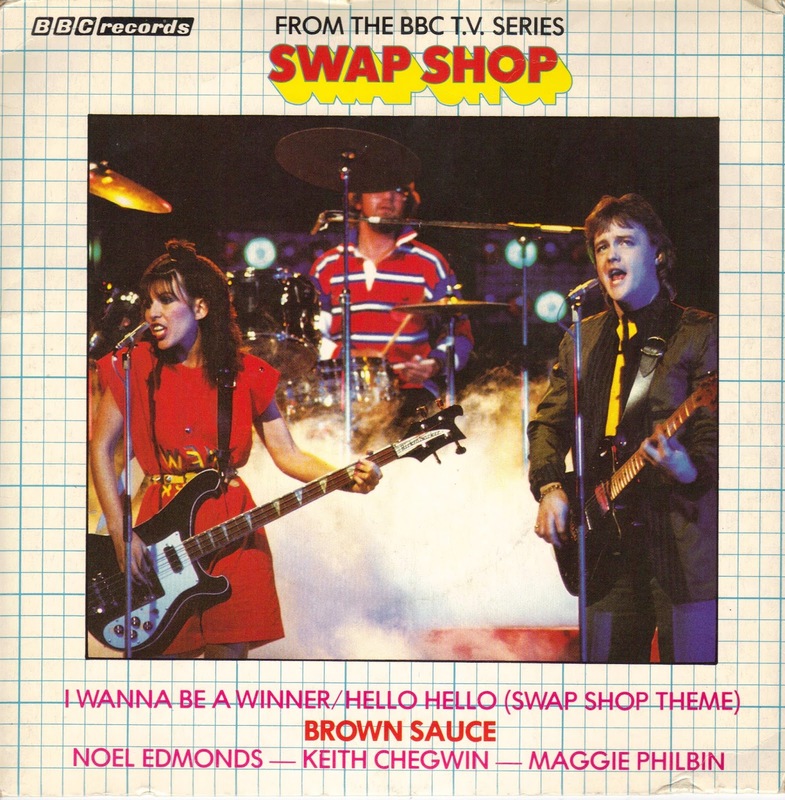 He also and wrote and sang backing vocals for the Swap Shop spin-off group Brown Sauce's UK Top 20 hit I Wanna Be a Winner: the ‘band’ Brown Sauce was made up of Swap Shop presenters Keith Chegwin, Maggie Philbin and Noel Edmonds. I’ve included both sides of the latter release here for you, just as a reminder of how truly awful the early 80s could be. 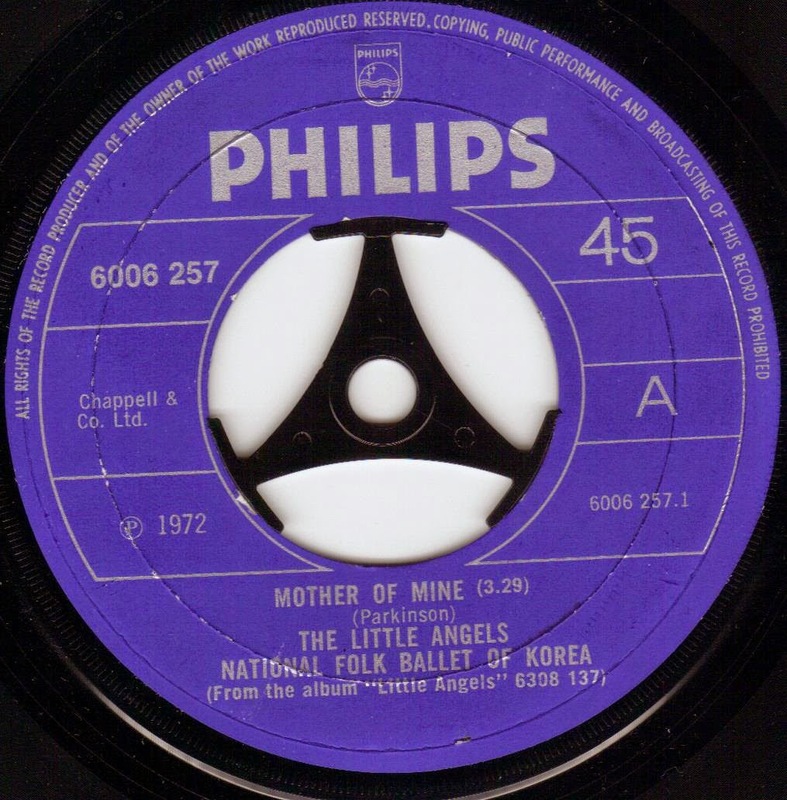 A slightly less creepy version of the Mini-Pops, The Little Angels National Folk Ballet of Korea released just one 45 in the UK in November 1972, a cover of the recent Neil Reid Top Three hit Mother of Mine backed with I’m Getting Married in the Morning, the show-stopping tune from the musical My Fair Lady. A follow-up album, Little Angels, received a limited European and Asian release the following year. Mother of Mine was an obvious choice for the pre-pubescent emotional blackmailers; a song guaranteed to tug at the heartstrings of a certain sector of the record buying public. Listening to their performance is akin to being beaten around the head by the Von Trapp Family Singers with sticks of candyfloss. However the supposed charm of a bunch of cute moppets singing I’m Getting Married in the Morning takes on a much more sinister tone when you realise that the choir was brought together by the notorious Sun Myung Moon, the founder of the Unification Church (aka the Moonies), whose bizarre blessing ceremonies gained international attention for joining thousands of identically-dressed brides and grooms - many of whom met at the ceremony for the first time - in distinctly unholy matrimony. Ignore the dodgy pronunciation, I reckon that there were a few dissenters in the ranks. Listen carefully: I’m sure some of the kids are singing ‘Kim Jong’, rather than ‘ding-dong’. Dance troupe and choral company the Little Angels Children’s Folk Ballet of Korea was founded in 1962 by the Rev. Moon and his wife, Hak Ja Han, as a way to project a positive image of South Korea. Still in existence today (the lineup changes, Menudo-like, whenever a member reaches her 16th birthday), the group’s dances are based on Korean legends and regional dances, and its costumes on traditional Korean styles. “My plan was to have these 17 children learn how to dance and then send them out into the world. Many foreigners knew about Korea only as a poor country that had fought a terrible war,” said Reverend Moon in his less-than reliable memoir. “I wanted to show them the beautiful dances of Korea so that they would realise that the Korean people are a people of culture." In 1973, shortly after they released their one and only British single, they performed at the United Nations Headquarters in New York. They have appeared Stateside on many occasions, including in 1993 when, according to a contemporary review in The New York Times, the troupe featured ‘girls from seven to 15 years old...dressed in a wide variety of colourful costumes, some drawn from traditional Korean styles. They still glide, dip and spin in mini-spectacles, inspired by Korean legends and regional dances that often resemble gracious precision drills’. The group has expanded recently and, in an uncharacteristic nod to the modern world, has added a solitary young boy to its’ cast of 33 young girls. In 2010 the Little Angels toured the world, visiting the 16 nations that had sent troops to support South Korea in the United Nations force during the war, ‘to provide “breathtaking and heart-warming” performances that will honour and cheer the countries’ veterans, express the deep gratitude the Korean people feel toward all Americans for preserving their freedom, and celebrate the enduring Korean-American friendship’. The tour was sponsored by the Korean War 60th Anniversary Memorial Committee, whose chairman, Bo Hi Pak, is also the president of the Little Angels. They played in London that October. Born October 17, 1938 in Butte, Montana – the former mining town which, in its heyday, was home to hundreds of saloons and a notorious red-light district – Robert Craig ‘Evel’ Knievel was an American daredevil, entertainer and (or so it says on Wikipedia) ‘international icon’. The original Lance Murdoch, between 1965 and 1980 he attempted over 75 ramp-to-ramp motorcycle jumps in his red, white and blue leather cat suit: in 1974 a failed jump across Snake River Canyon in a steam-powered rocket almost resulted in his death and, during his professional career, he broke 433 bones – earning him an entry in the Guinness Book of World Records as the survivor of "most bones broken in a lifetime". He was well paid for his feats of daring. He earned $1 million for his jump over 13 buses at Wembley Stadium (the crash landing broke his pelvis) and more than $6 million for the Snake River Canyon attempt, where the parachute on his rocket-powered Skycycle malfunctioned and deployed after take-off. Strong winds blew the cycle into the canyon, landing him close to the river below. At the height of his fame Evel appeared in movies, made dozens of appearances as a guest on hit TV shows including The Bionic Woman and the Sonny and Cher Show and had a range of toys (or collectable figurines I guess you’d call them now) based on him, his family and his contemporaries. Knievel toys accounted for more than $300 million in sales in the 70s and 80s. Thankfully, in 1974, he released the thoroughly bizarre album, with the incredibly original title Evel Knievel, which featured a 26 minute press conference, a song about (but not by) him and the great man himself reciting a self-composed poem. It’s a pretty boring listen: luckily the two standout tracks – Why and The Ballad of Evel Knievel – were issued as a single. And it’s those two tracks I present for you today. When producer Ron Kramer was searching for a vocalist to sing a song he had co-written written for Knievel he approached John Culliton Mahoney, who performs The Ballad of Evel Knievel in a shrill vibrato. It sounds to me like the theme tune to a Saturday tea time TV show, which it possibly could have been intended for. Why is just horrible: a miserable piece of poetry worthy of a ten year-old in which, over swelling strings, Evel talks about his faith in God, and how the power of prayer has pulled him through his darkest days. Originally issued on Amherst in 1974 (the long-established US company owned by Leonard Silver that also licensed 45s by The Stylistics, Van McCoy and Glenn Medeiros), the album was reissued on Tin Toy Records (on CD in 2000) as Evel Speaks to the Kids. A strange move, as Tin Toy seem to specialise in semi-legit (read 'dodgy') Throbbing Gristle and Psychic TV albums. To the best of my knowledge Evel Speaks to the Kids is a Genesis P Orridge-free zone. After years of licensing tracks from other stables, John Culliton Mahoney became the first artist to sign directly to Amherst Records in 1973 (according to an article in the Niagara Falls Reporter), releasing his first album, Love Not Guaranteed, the same year. He’s still performing today. The promoter for the Snake River Canyon jump, Shelly Saltman, wrote a book entitled Evel Knievel on Tour. The book painted an unflattering picture of Knievel's character, alleging that he abused his wife and kids and he used drugs. Enraged, Knievel flew to California to confront Saltman, who was a Vice President at 20th Century Fox. Gaining entrance to the studio lot, one of Knievel's friends grabbed Saltman and held him while Knievel, with both arms still in casts, attacked him with an aluminium baseball bat, declaring, "I'm going to kill you!" According to a witness, Knievel struck repeated blows at Saltman's head, with Saltman blocking the blows with his left arm. Saltman's arm and wrist were shattered in several places before he fell to the ground unconscious. It took numerous surgeries and permanent metal plates to eventually give Saltman back the use of his arm. Saltman's book was pulled from the shelves by the publisher after Knievel threatened to sue. Saltman later produced documents in both criminal and civil court that proved that, although Knievel claimed to have been insulted by statements in Saltman's book, he and his lawyers had actually been given editorial access to the book and had approved and signed off on every word prior to its publication. Knievel pleaded guilty to battery and was sentenced to three years' probation and six months in county jail. Unsurprisingly, Knievel lost most of his marketing endorsements and deals and, with no income from jumping or sponsorship, he was eventually forced to declare bankruptcy. He still managed to make a living though: thousands came to Butte each year to celebrate Evel Knievel Day, where he would sell autographs and memorabilia. 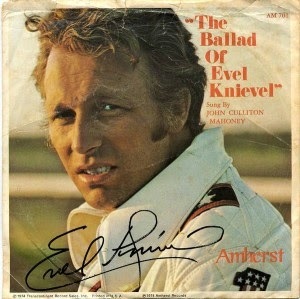 Evel died in November 2007 at the age of 69. He had been in failing health for years, suffering from diabetes and pulmonary fibrosis (an incurable condition that scarred his lungs); he had undergone a liver transplant in 1999 after nearly dying of hepatitis C, likely contracted through a blood transfusion after one of his bone-shattering spill and he also suffered two strokes in the years before he passed. The Wonder Who? was a pseudonym used by the Four Seasons, who released a cover of the Bob Dylan song Don't Think Twice (truncating the correct title of the song) under that name in 1965. An outtake from their Sing Hits By Bacharach, David and Dylan album, the story has it that Valli was not happy with his vocals during the recording of a ‘straight’ version of Don't Think Twice, It's All Right and he decided to record the song with a ‘joke’ falsetto vocal to ease the tension in the studio. As the group were still enjoying hit singles (Let’s Hang On had been a Top Three hit recently and their next single, Working My Way Back to You would go Top 10) to save damaging the group’s career it was decided to issue the track with the Wonder Who? nom-de-plume. Everyone involved was surprised when it became a major hit, peaking on the Billboard charts at Number 12. Called ‘about the most camp cover of a Dylan tune that could be imagined’ by Richie Unterberger on allmusic.com, lead singer Frankie Valli, bizarrely, decides to blow falsetto raspberries throughout the recording. Valli made this rather peculiar sound (which, to be perfectly honest, I first assumed was a flaw in the mastering) in imitation of the singer Rose Murphy, who used the brrp, brrp sound of a telephone ringing on her hit Busy Line. Not ones to look a gift horse in the mouth, the Four Seasons and Philips kept the joke going a little longer, resurrecting the Wonder Who? for this dismal and, frankly, ridiculous cover of the Shirley temple classic On the Good Ship Lollipop, backed with an equally awful reworking of the old chestnut You’re Nobody Till Somebody Loves You – with both songs again featuring Frankie dong his best (or worst) impersonation of a Trimphone. Both sides scraped the Billboard 100, with On the Good Ship Lollipop peaking at 87 during its’ three-week run and You’re Nobody Till Somebody Loves You reaching the giddy heights of 96. Their third outing as the Wonder Who?, 1967's Lonesome Road, peaked at 89. A fourth Wonder Who single (sans the question mark) was simply a reissue of an old Four Seasons recording, Peanuts, issued as a cash-in by the group’s former label Vee-Jay. On the Good Ship Lollipop would also be covered (and issued as a single in 1969) by perennial pop outsider Tiny Tim. The Four Seasons would continue to release records – and score hits - under their own name and under that of leader Frankie Valli (real name Francesco Stephen Castelluccio) for the next decade. Throughout their now 50-plus year history the various line-ups of the group have issued tracks under a variety of names; Frankie Valli solo releases have turned up on Four Seasons albums and vice versa, and Valli – who suffered a debilitating deafness for almost two decades before having it corrected by surgery – is still touring today, fronting a new version of the Four Seasons as he enters his 80s. As the new millennium arrived the hit musical Jersey Boys reignited interest in their career once again, Valli appeared in a number of episodes of the hit TV series The Sopranos and, in 2007, a remix of their 40-year old single Beggin’ saw the act return to the UK charts a full 45 years after their first British chart entry, Sherry.